Sento apologizes to Kazumi for losing himself again. But Kazumi says it’s over and Sento need not worry about it anymore. Misora hands Sento the kill switch back and says his punishment for trying to get her to use it is for him to make dinner. As they walk away, Kazumi overhears Misora’s cute “Please” and immediately recognizes it as Miitan’s voice. He quickly runs back and professes his love for her. He wants to shake her hand, but Sawa says it’ll cost him 50,000 dolks. Kazumi says that’s no problem and offers 100,000 to take a picture with her. The two remaining Crows stop him as that’s the only money they have left to survive. 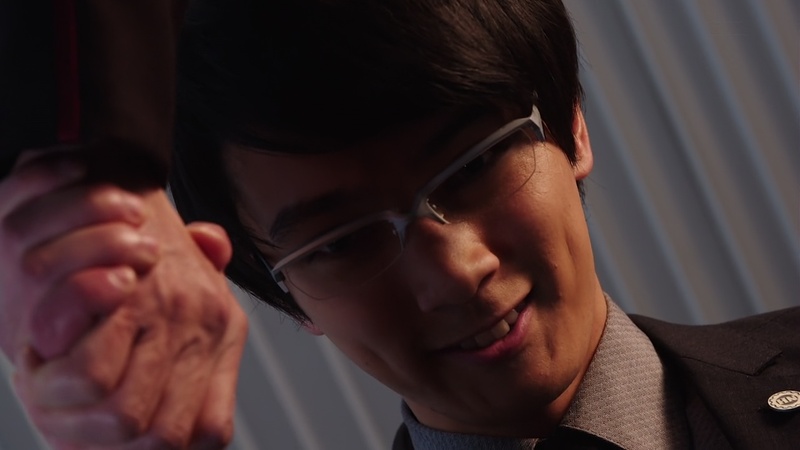 Just then, Papa Prime Minister calls Sento to inform him of Seito attacking Hokuto and taking over. Kazumi tries to call the Hokuto PM, but it is Blood Stark who answers. Soichi says Hokuto, including Kazumi and the Crows’ friends and family, will soon be under Seito control. He advises them to wait for the Seito PM’s address to Touto. They all head to the Prime Minister’s residence. Akaba notices Kiba is not with them. Seito Prime Minister Mido addresses Touto and declares war. He shows live footage of their “weapons” in action. And Kazumi is shocked to see it is from his family’s farm. Seito Guardians have the farmworkers hostage when suddenly Kiba appears. He demands they release his friends and he morphs into Smash mode. He is able to take out the Guardians. But two mysterious young men appear. They morph and Ryuga recognizes it as the Kaiser System developed by Mogami Kaiser. They introduce themselves as Engine Bros and Remocon Bros.
Kiba takes them both on, but the Bros seem to have more firepower than him. The Bros issue a challenge to Grease. If he wants to save Kiba, then he must become a weapon for Seito. The prime minister appears again and says they welcome Grease with open arms. Kazumi gets up and he and Akaba start to leave. Sento says this is a trap. But Kazumi says he can’t just leave Kiba to die. Ryuga offers to come with, but Sento says them going would be considered an act of aggression against Hokuto and would escalate the war. Sento gives Kazumi Hokuto’s four bottles and asks them to bring Kiba back to Touto. 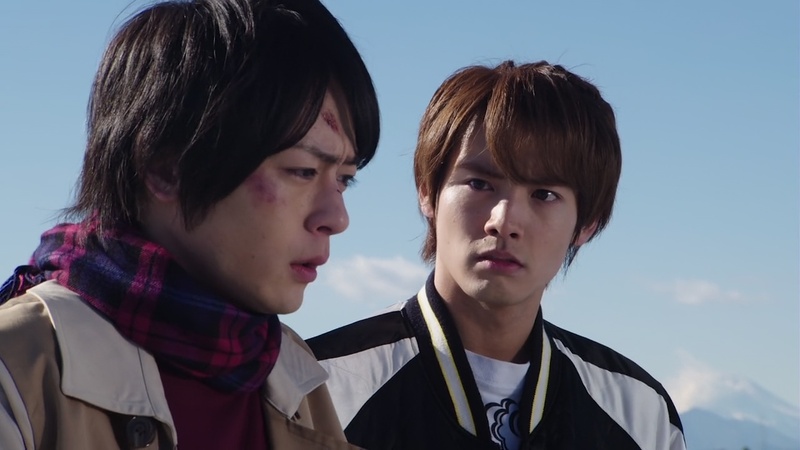 Sento and Ryuga may not be able to go to Hokuto, but they can work together if they lure Seito into Touto. Kazumi and Akaba arrive at the farm and find Kiba chained up and brutally tortured. Kazumi and Akaba both henshin. Akaba breaks Kiba free from the chains as Kazumi takes on the two Bros. The farmers are able to escape. But Kazumi seems to be no match for the Bros. They shoot at Kiba, but Akaba steps in front to block the shots. Kazumi does the same, despite already having absorbed several hits. He remembers Sento telling them to lure the Bros to Touto, so he uses the Helicopter FullBottle to get him, Akaba and Kiba away and back towards Touto. Seito Prime Minister commends Nariaki on creating the Bros using the Kaiser System. Nanba is also in the room and says Seito must take back the entire country and he will help in any way he can. That includes Seito’s very own Kamen Rider. While they are slowly flying toward the Skywall, Kazumi, Akaba and Kiba are shot down by the Bros. They land hard by the river. The impact forces Kazumi to dehenshin. But the impact leaves Kiba even worse off and he tearily tells his boss that this might be the end for him. The Bros approach them. Kiba tells Kazumi and Akaba to leave him and run to safety. Kazumi refuses to do that. Akaba tries to fight the Bros, but just gets knocked back. The Bros prepare an Engine Steam Funky Shot Finisher, but Kiba morphs and steps in front, absorbing the attack himself. Kiba collapses to the ground and demorphs. Kazumi hurries over to him, upset that Kiba would do that. Kiba says he had to, otherwise Kazumi and Akaba would never run and save themselves. Syokichi gives Kazumi one of his dogtags and says he will be watching over him with Aoba. Syokichi Kiba disappears. Gone forever. Kazumi tries punching one of the Bros, but only gets hit right back. He gets knocked out. Akaba shoots at the Bros, allowing him to whisk Kazumi away. 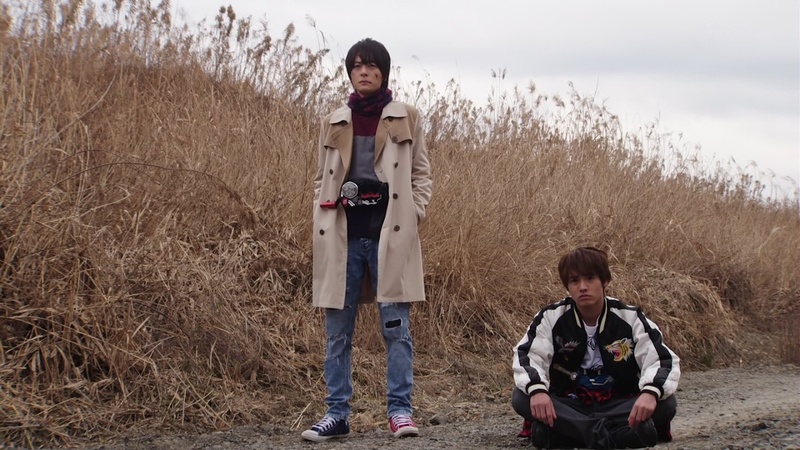 Sento and Ryuga are waiting on the SkyRoad when they see an also injured Akaba propping up a beaten and bruised Kazumi. They hurry over to them. Kazumi tells them the bad news about Kiba. The Bros arrive and Sento tells Kazumi to allow him and Ryuga to avenge Kiba. 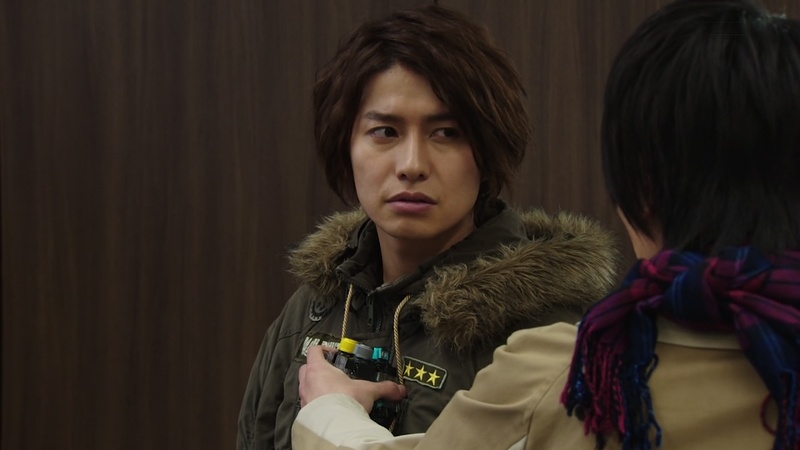 Sento warns Ryuga that he’s going to use Hazard Trigger. Ryuga understands. They both henshin. 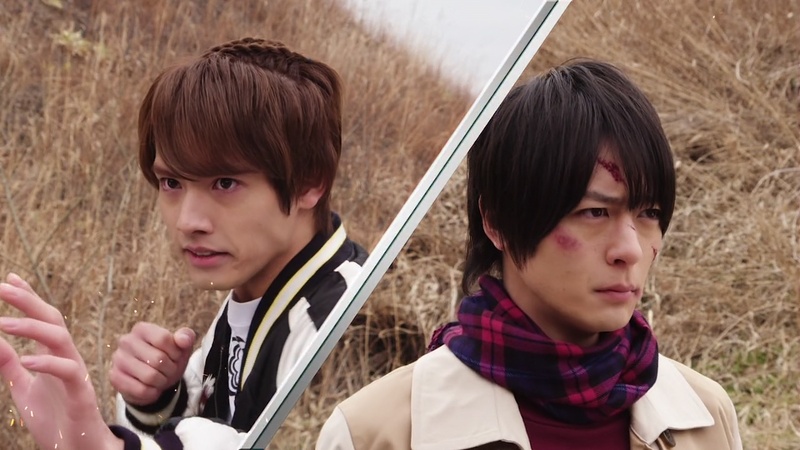 Sento and Ryuga take on the Bros who give them a good fight. But Sento starts to lose himself. 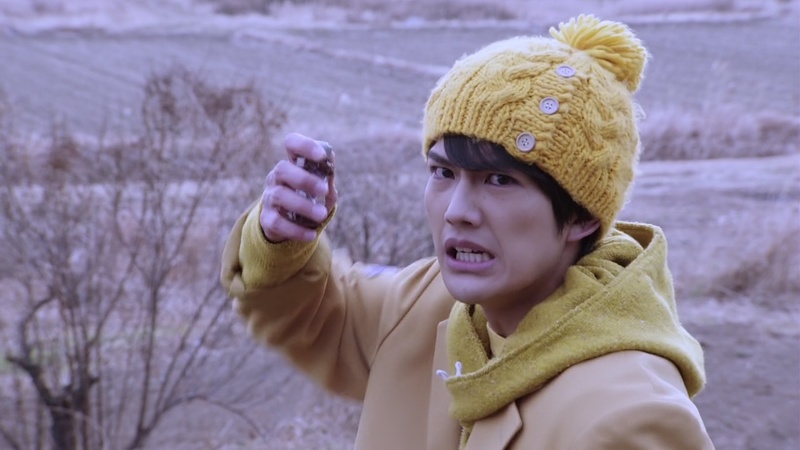 Ryuga sees it and he immediately shoots the Hazard Trigger off Sento’s driver. That forces Sento to downhenshin. Akaba wonders why Sento would go this far for them. Kazumi says this is why he is strong, but also why he won’t win. Meanwhile, the Seito Rider henshins on his way to where Sento and the others are. Sento and Ryuga deliver finishing kicks at the Bros and it makes them step back, amazed at them still having that much power left. But the scene is interrupted by the new Rider. The Bros decide to leave Sento and Ryuga to the new Rider. Sento and Ryuga are confident they can take him on. 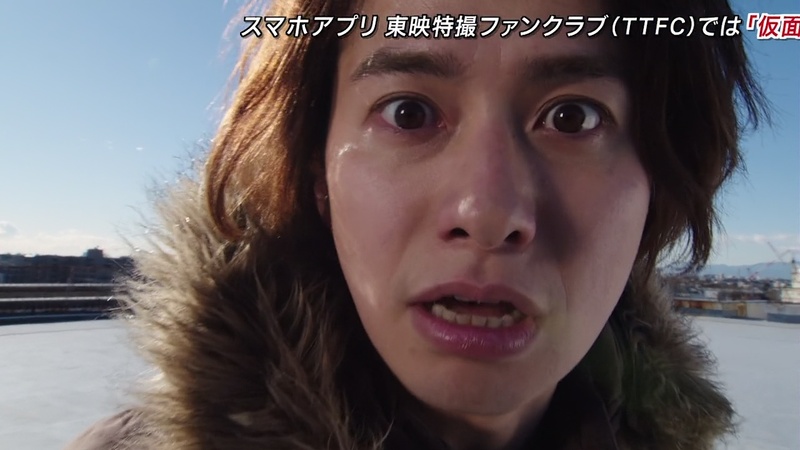 But even alone, the new Rider has no problem having his way against Sento and Ryuga. 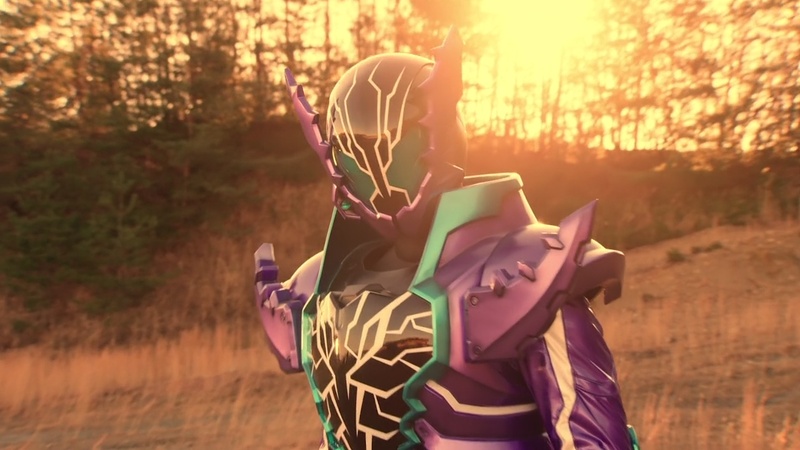 He first forces Ryuga to dehenshin and then chomps Sento to force him to explode and dehenshin as well. The new Rider introduces himself as Kamen Rider Rogue. And that means this could only be one person: Gentoku. Interesting episode. It had a tough act to follow after the last two great episodes. But this episode really was all meant to set up the big reveal that Gentoku is the new Rider. Though of course, this is not a surprise at all. The bigger surprise was Kiba’s death. I didn’t really expect either Kiba or Akaba to be killed off so soon, if ever. It was certainly a great, heroic moment for Kiba to go to Hokuto all alone. But that makes me kind of sad as we haven’t really gotten much character development for any of the Crows other than the fact that they are very loyal to Kazumi. It would’ve been nice to see at least Kiba and Akaba’s personal stories a little bit. 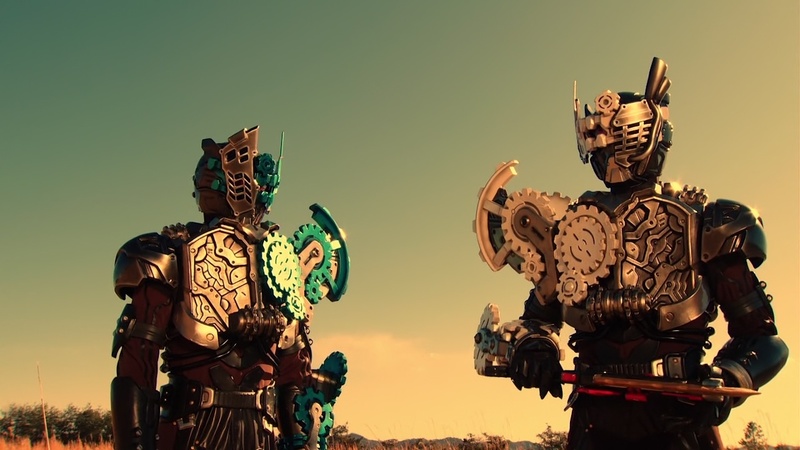 But now I am assuming the show will just be killing each Crow off to give Kazumi a reason to fight or even team up with Sento and Ryuga for good. That could provide an interesting possibility for story moving forward if they do it. Elsewhere, the Kazumi/Miitan moment was amusing. It’s a nice little quirk for Kazumi’s character. But who knows if it’ll turn into a big plot point later. 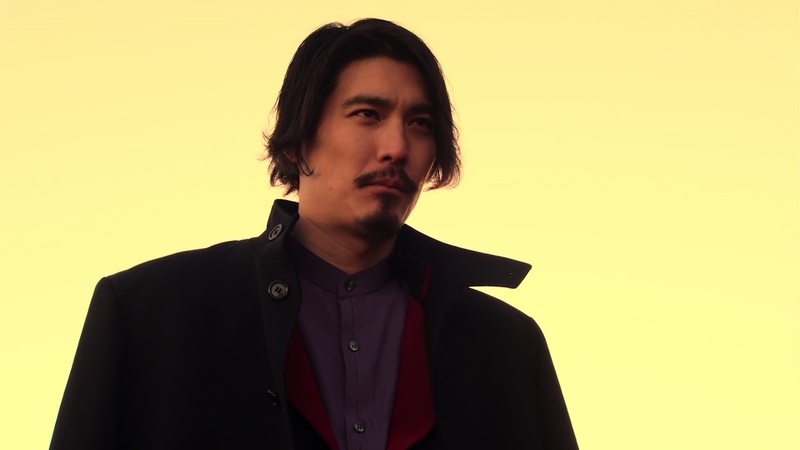 As this episode was focused more on Kazumi and setting up Kiba’s death and then the build up to Gentoku’s reveal, we didn’t see much of Sento, Ryuga and the Gang. But that’s perfectly alright. This episode was fine, but definitely pales a little in comparison to the last few.